This study was dedicated to the temporal order. 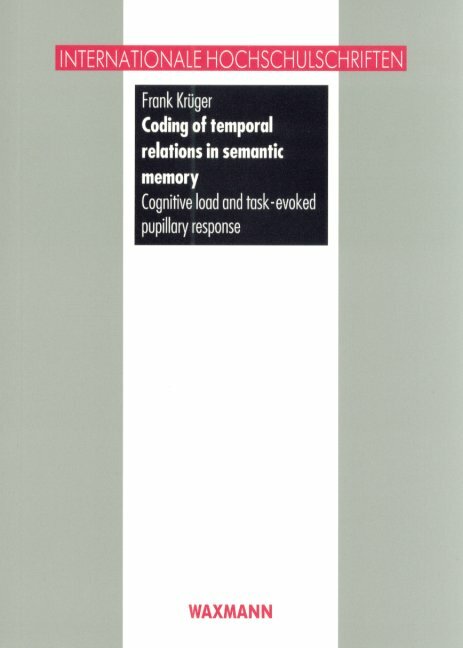 The discussion focused on the encoding, mental representation, and activation of event concepts and event sequence concepts in the conceptual knowledge structures of semantic memory. The study was devoted to find out whether there is a time's arrow within the features of event concepts and within highly typical event sequence concepts. Taken together, the most striking findings of the experiments and the meta-analysis were: First, the time's arrow is mentally coded in different ways: for highly typical event sequences by (1) higher association strength, and (2) expectancy-based selection processes, and (3) for dynamic event concepts by inferential processes based on feature matching. Second, the psycho-physiological indicators maximal pupil diameter and dilatation time coincided with the psychological indicators recognition time and error rate. Finally, the pupillary parameters provided additional new information: The processing of information opposite to the preferred temporal order consumed not just more time and produced more errors, but also demanded more mental resources. Frank Krüger, born in 1969, is scientific employee at the Department of Cognitive Psychology of Humboldt-University in Berlin. Focus of research: Cognitive Psychology, Psychophysiology and Neuropsychology.